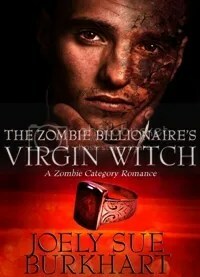 I recently finished reading Joely Sue Burkhart’s fun book The Zombie Billionaire’s Virgin Witch. It’s a self-published eBook that I received as a review copy. However, I love Joely’s work enough – and was intrigued by the premise – that I would have bought it anyway. So, instead of buying the copy that *I* read, I’m going to buy a copy for *you* to read. I will announce the winner on November 1st, provided that I’m not too crazy with NaNoWriMo. I will certainly contact the winner ASAP, and certainly by that weekend. Comment on this contest post for an entry. Tweet about this contest (and let me know you did!) for an entry. Comment on the book review that I will be posting Thursday for an entry. Me: I’m a huge Disney fan, so I inevitably thought of “Ratatouille” when reading this. Did that movie (or others) have any influence on how you wrote the book? Joely: Yay, absolutely! We (the monsters and I) loved Ratatouille so much I had to name the heroine and the restaurant after Remy the rat. (Me: I thought so… 🙂 ) My favorite part of that movie is when he’s mixing foods together and it’s like a symphony in his mouth. I tried to capture that same magic in Clare’s food. Me: What part of this story came first? The zombie romance, or the system of magic? Joely: Zombie romance came first. Angela James said something on Twitter about how hilarious a zombie category romance spoof would be, and I couldn’t resist! The magic system developed to make the zombie aspect more tolerable (less icky!) for the romance. Me: I’m glad you made the zombie aspect less icky! 🙂 Helga is such a great secondary character. Did you base her off of someone you know? Me: These dishes sound amazing and they do say to “write what you know.” Is this a case where you’re a gourmet chef at heart? Joely: Dang, I wish! I do watch a lot of Top Chef, Hell’s Kitchen and Food Network — and we do love to eat. But I’m not a gourmet foodie. I do try to make a lot of things at home from scratch, like bread, and I’ve started grinding my own wheat for the health benefits. Okay, maybe I’m a fledgling foodie? Me: I don’t remember when you started actually working on this one, but I did see that you’re donating your 4th quarter 2012 profits to Rebuild Joplin. Had you started writing before the tornado disaster in Joplin, and did that influence your desire to set the story there? Joely: I don’t remember exactly when I started this book (I do know that I finished it during NaNoWriMo last year), but it was always going to be set in Joplin. Our favorite restaurant, Mythos, is there, and I knew I was going to model Remy’s after it. Then the tornado hit (my sister lives in Joplin) and I knew I had to do something to help. * Sweet or savory? Savory. I really don’t do a lot of sweets, but keep me away from anything like homemade bread or hot buttered popcorn! * Wine or beer? Wine. I’ll drink beer occasionally but I love a glass of merlot. * Princess or pirate? How about a princess pirate? I’ve promised to dedicate a female pirate book soon to S.J. Collins (set in the Jane Austen Space Opera world). * Cheese or chocolate (with your wine)? Cheese – or homemade bread! * eBook or paper? Both, but increasingly eBook. The monsters and I love my Kindle! * Alpha male or nice guy? Alpha all the way. 🙂 But alphas can be nice guys too. Sometimes. * Zombies or vampires? 10-15 years ago I would have said vampires hands down, but I’m sick to death of sparkly vampires (I have a teenage daughter who’s dying for Breaking Dawn part 2). Definitely zombies! Thanks again for playing along, and for writing great stories! I look forward to what you do in this world – it’s got great potential for lots more stories! Thanks so much for having me, Nicole! I’m so glad you enjoyed this world and I can’t wait to write the red-haired witch’s story (http://joelysueburkhart.com/the-blog/giveaways/make-me-write-the-book-part-1/)! Next Post Ten On Tuesday: Trick Or Treat! This is the first I’ve heard for “zombie category romance,” lol. I’m also quite glad that it’ll be less icky than the usual zombie fare. Thanks for the interview! I hope you don’t mind winning by default, because you just did! 🙂 I’ll email you, and I hope you enjoy the book.